Montecristo White and Montecristo Platinum now come in newly redesigned boxes. The new packaging is �more streamlined and displays beautifully at retail,� according to an Altadis U.S.A. spokesperson. In addition, the new boxes will contain 27 cigars instead of 25 as in the past. The only exceptions are the Montecristo Platinum Rothchilde and Churchill which are packaged in tubes, 15 to the box. Both Montecristo White and Platinum are made at the Tabacalera de Garc�a located in La Romona in the Dominican Republic. Montecristo White is handcrafted with an Ecuadorian Connecticut Shade wrapper, Nicaraguan binder leaf, and Dominican and Nicaraguan long fillers. It is a medium bodied smoke, described by the manufacturer as �smooth and mellow, with subtle complexities of flavor,� offered in seven sizes with retail prices range from $7.00 to $12.00. Montecristo Platinum is constructed with a hand-selected San Andres Cubano wrapper, Dominic an binder leaf, and Dominican, Nicaraguan, and Peruvian long fillers that deliver a �rich and tasty flavor with a touch of spice.� It is available in six sizes with suggested retail prices ranging from $5.00 to $10.00. Altadis U.S.A., Ft. Lauderdale, Fla., Toll-free: (800) 683-8800, Tel: (954) 772-9000, E-mail: sales.admin@altadisusa.com, Web: www.altadisusa.com. Swedish Match North America has developed Foil Fresh, an innovative new pouch packaging method which it has rolled out for two of its popular mass market cigar brands. �This is a first for mass market cigars,� says Brian Love, the company�s director of cigar marketing. 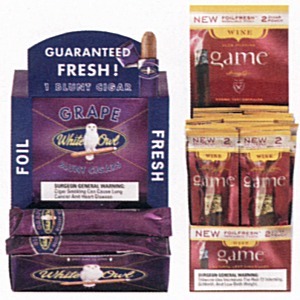 �For the consumer, it means the cigar you are purchasing is as fresh as the day it was made.� Resealable Foil Fresh pouches are currently available on Game and White Owl cigarillo two packs and will be introduced on Game Palma and White Owl Peach and Grape blunts in single stick packaging on March 17th. Swedish Match first introduced the foil pouch more than 40 years ago for one of its loose leaf products; refinements on the technique have resulted in foil packaging specifically designed for the cigar consumer. Consumer research shows cigar smokers increasingly demanding freshness, with 65 percent of consumers polled saying freshness is the most important consideration in brand selection, well ahead of taste and price. �The level of freshness is the deal breaker and the moment of truth for a cigar smoker is squeezing the cigar and discovering its freshness,� says Love. Swedish Match North America, Inc., Richmond, Va., Toll-free: (800) 367-3677, Tel: (804) 302-1700, Fax: (804) 302-1760, Email: info@smna.com. 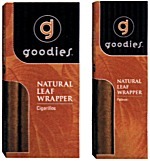 Swisher International has introduced two new value-priced cigar products: Goodies Cigarillos and Goodies Palmas. Each is made with an authentic Connecticut shade wrapper which is properly aged to create a cool, mild, enjoyable smoke, and presented in eye-catching, upscale packaging. Each is available in Vanilla and Natural varieties, either in packs or 25-count impulse displays. Swisher International, Inc., Jacksonville, Fla., Toll-free: (800) 874-9720, Tel: (904) 353-4311, Fax: (800) 628-4675. 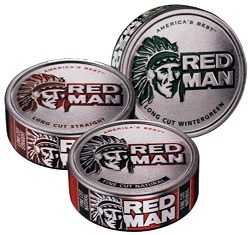 The number-one brand of moist smokeless chewing tobacco for the past 100 years - Red Man - has entered the fast-growing moist snuff category with Red Man Premium Moist Snuff. The product is now offered in eight states: Indiana, Ohio, West Virginia, Kentucky, Louisiana, Mississippi, Arkansas, western Pennsylvania, and southwest Tennessee, representing 41 percent of the category market. Red Man Moist Snuff is the first premium product in a price value category, appealing to consumers looking for a high quality moist snuff brand that delivers full-flavored tobacco. Produced from a blend of full-bodied, high-quality tobacco, Red Man Moist Snuff is available in Long Cut Wintergreen, Fine Cut Natural, and Long Cut straight - the three most popular flavors in the moist snuff category. The product also has uniquely original packaging highlighted by an embossed metal lid and metallic side labeling. Swedish Match North America, Inc., Richmond, Va., Toll-free: (800) 367-3677, Tel: (804) 302 -1700, Fax: (804) 302-1760, Email: info@smna.com. 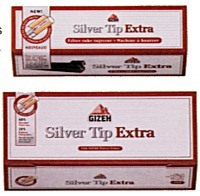 Silver Tip Extra Tubes are packed 200 Tubes per box and 50 boxes per case. Silver Tip Extra lnjectors are packed 20 per case. These new products join Gizeh�s high quality Silver Tip, Twister, and Mascotte line of RYO and MYO products, a smoking collection that boasts a tradition that is almost 83 years old. Gizeh of North America, Ltd., Brea, Calif., Toll-free: (888) 989-4662, Tel: (562) 691-1957, Fax: (562) 691-3499. A new limited-production brand, Winston Churchill, has been rolled out by Davidoff of Geneva for worldwide distribution to Davidoff appointed merchants and Avo retailers. The four-shape line was a joint project of Churchill�s grandson, Winston S. Churchill, and Davidoff�s master cigarmaker, Hendrik Kelner. The full-bodied blend is comprised entirely of Cuban-seed tobaccos from the Dominican Republic, Ecuador, Nicaragua, and Peru with a dark sun-grown wrapper leaf from Ecuador that delivers a spicey, highly aromatic smoke. Cigars Davidoff, the Dominican Republic factory which to date had produced only Davidoff brands, is rolling the new line. Four double-banded frontmarks, presented in 25-count Cuban-style paper-wrapped boxes, are offered: Chequers (5 1/2 x 46), No. 10 (5 1/4 x 52) Marrakesh (6 x 50), and Blenheim (7 x 48), bearing retail prices ranging from $13.50 to $22.00. Davidoff of Geneva, Stamford, Conn., Toll-free: (800) 232-8436, Web: www.davidoffusa.com. Famous Smoke Shop and its wholesale division, Cigar Domain, have introduced the Cruz Real premium cigar selection. The new line was created exclusively for the companies by Rocky Patel. 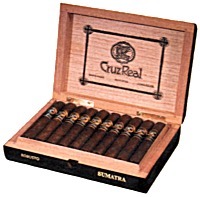 Cruz Real cigars�are handmade in Honduras with a blend of extra-long-aged Dominican and Nicaraguan long-filler tobaccos, Mexican binder, and a choice of two very flavorful and aromatic wrapper leaves: light, silky U.S. Connecticut Shade, or dark, toothy Sumatra. �Value is what customers want, and with Cruz Real, cigar smokers are getting a very flavorful �$10 cigar� that costs about half the price, yet is every bit as high in quality,� said Famous Smoke Shop president, Arthur Zaretsky, who worked with Patel on the blend. Designed to appeal to every taste preference, Cruz Real is presented in boxes of 20 cigars and 5-pack samplers. Starting at under $96 per box, prices range from $6 suggested retail for the 5 1/2 x 42 Corona, to $7 for the 7 x 50 Churchill. 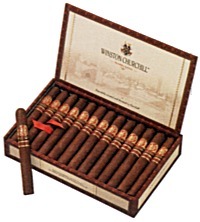 The three other sizes in the line include a Lonsdale (6 1/2 x 44), a Toro (6 x 52), and a Robusto (5 x 50). Cigar Domain, Easton, Pa., Toll-free: (800) 564-2523, Email: info@cigardomain.com, Web: www.cigardomain.com. The newest flavor in Habana Cuba Cigar Co.�s flavored Oliveros cigar line is also the most popular: Cuban Mojito. Using the same flavoring process that have made Oliveros flavors so successful, the Cuban Mojito is all-long-filler, 5 x 36 petite corona cigar with an attractive Indonesian Sumatra wrapper and a sweet touch of rum, mint, and lime juice that whisks smokers straight to Cuba�s southern shores. The most expensive coffee in the world is the inspiration for Habana Cuba�s new coffee flavored line, Kopi Luwak, an all-long filler, box-pressed cigar with a Brazilian Maduro wrapper that delivers an exotic, almost musty blend of java, mocha, coffee, and vanilla bean flavors. 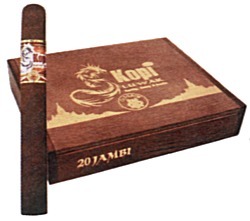 A blend of all-Cuban-seed ligero Cubano and seco Dominicano filler and Dominican Olor binder, Kopi Luwak is available in either Jambi (5 1/2 x 42 corona) or Luwak (5 3/4 x 50 toro) frontmarks, presented in 25-count boxes with suggested retail pricing of $94 and $108, respectively. Both new blends have consistent flavor throughout the entire cigar, an Oliveros Benchmark. Habana Cuba Cigar Company, Miami, Fla., Tel: (305) 557-6919, Fax: (305) 557-6919, Fax: (305) 557-2219, Web: www.OliverosCigars.com. Tobacco grower and cigar maker Nestor Plascencia has teamed up with House of Oxford for many cigar projects over the years; Generations by Nestor is the latest. Each of the three sizes in this Honduran-made line has been individually blended by Nestor Plascencia Sr. and Nestor A. Plascencia Jr. to bring out the inherent characteristics of the tobacco for that size. Abuleo (7 x 5) is a medium to strong blend of Nicaraguan filler, Costa Rican binder, and a Nicaraguan Habano Rosado wrapper, $4 suggested retail. Papa (6 x 52) is a medium strength blend incorporating Nicaraguan and Mexican filler, Sumatra binder, and a Connecticut Ecuador wrapper; $3.80 retail. Finally, Hijo (5 x 48) is a mild to medium strength blend of Nicaraguan and Dominican filler, Sumatra binder, and Connecticut Ecuador wrapper with a suggested retail price of $3.50 each. Cigars are packaged in glossy wooden boxes of 20. House of Oxford Distributors, Somerset, N.J., Toll-free: (800) 831-8893, Tel: (732) 568-0300, Email: info@houseofoxford.com, Web: www.houseofoxford.com. The Camel brand has enjoyed a spate of line extensions in recent years, but its signature formulation has remained substantially unchanged, both inside and outside the pack. But in January, a �modernized� version of the Camel that got it all started in 1913 began appearing at retail sporting an eye-catching new package and an upgraded leaf blend. As existing supplies of the current version sell through, they will be replaced with this new version. The process may be finished nationwide in March. 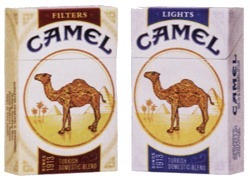 The new graphics retain the camel and much of the imagery from the traditional pack design but make it more colorful and creative, while the tobacco blend has been updated with more high quality tobacco. Continuity is further maintained in the new graphics with the retention of the elements of Camel�s traditional desert scene: a dromedary in the foreground, a large pyramid to the right, and a smaller pyramid with a stylized oasis at the left. But this iconic scene is now contained in a circle superimposed on a wide colored band that extends around the pack from top to bottom. Howard said that much of the direction for the updating came from the brand�s adult smokers via the brand�s age-restricted website. R.J. Reynolds employees also provided considerable input. Styles featuring the new look and blend are Camel Full Flavor, Light, Ultra Light, Menthol, and Menthol Light, Howard said. R.J. Reynolds Tobacco Co., Winston-Salem, N.C., Tel: (336) 741-7264, Web: www.rjrt.com. For the cigarette consumer that increasingly demands a top quality product and won�t settle for conventional tobacco products with preservatives, flavors, and chemical agents, German-based Von Eicken offers additive-free Manitou cigarettes. Manitou contains no preservatives, chemical burning agents, moisturizers, or flavors and are made only from the highest quality 100% natural premium tobacco leaf. 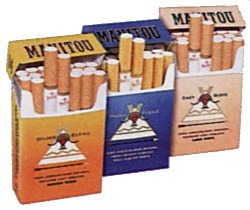 Since it is additive-free, the taste of Manitou is solely based on the best grade, pure tobacco leaf. �The image behind Manitou is to be interpreted as one of freedom and the right to make your own decisions,� says company president Pit Brockhausen. �There are different kinds of smokers. Many want to enjoy the quality and the lifestyle associated with a unique brand. They want to be different. Smoking something different is part of that expression of individuality.� For consumers and retailers alike, Von Eicken provides complete information on how Manitou products are produced at www.manitou.com. The tobacco blend of Manitou is based on pure Virginia tobaccos; their different provenance defines their character. Highest quality U.S. Virginia, Brazilian Virginia, and Zimbabwe Virginia form the basis of this tobacco mixture. Three varieties are offered: Manitou Original Blend (full flavor), Manitou Golden Blend (medium), and Manitou Easy Blend (light). Papiotrade Inc., Omaha, Neb., Toll-free: (866) 688-5915, Tel: (402) 597-1558, Web: www.papiotrade.com. The Honduran-made Punch Gran Puro line now has a hefty new seventh shape - the 6 1/4 x 60 Sesenta - Spanish for �sixty.� The new size debuts with a suggested retail price of $5.25 per cigar. Don Tom�s Clasico also has a new addition, bringing its total number of sizes up to eight� - the 6 in. x 54 ring gauge Toro which ships in February and carries a suggested retail price of $4.30 per stick. La Gloria Cubana Serie R�s Belicoso frontmark (5 3/4 �x 56) is now available as an open stock item and carries a suggested retail price of $6.50 per cigar. Beginning in late February, two Hoyo de Monterrey sampler packs, each containing four Hoyo cigars for the price of three, will be available in the popular Dark Sumatra and Hoyo de Tradici�n collections. Helix Remix Caf� Royal, the new coffee-flavored line extension offered in four shapes and retailing from $2.70 to $3.40 per stick, began shipping in December. The line was originally announced as Helix Remix Caf� Mocha, but has been renamed. Finally, General Cigar is also set to release its annual shipment of Punch Rare Corojo in March. The perennial favorite will available until its allotment has been depleted at retail, and will be replenished with limited allocations later this year. 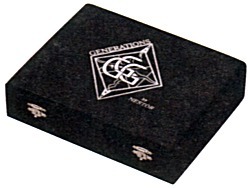 General Cigar Co., Inc., Richmond, N.C., Toll-free: (800) 273-8044, Tel: (804) 302-1700, Web: www.cigarworld.com.